Israel's Gifts of Hope Foundation is working to support Siblings, Friends, and Family Members who have been affected by Chicago's Violence. Our mission is to give back to those who feel like all is lost after losing a loved one and need a little bit of Hope, Love, & Peace. We strive to build stronger communities and bonds between survivor families and society. 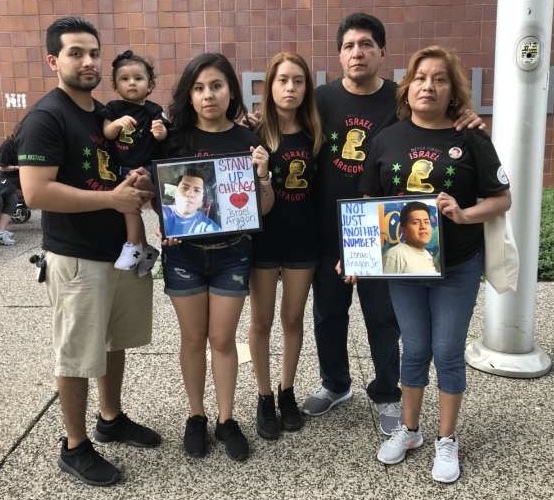 After the tragic loss of Israel Aragon Jr., we decided that while it was easiest to sit at home and let grief overcome our every breath, it would be more healing to figure out a way to continue to honor his life, his dreams, his goals. It was then that we decided to launch a foundation in his honor that focuses on supporting others, who like us, have been affected by the never ending gun violence in the city. While our grieving process continues, we have found that honoring Israel, by giving back and creating memories with others and their loved ones has become completely rewarding. In the midst of so much tragedy we have found a way to share love, hope, & spread peace while at the same time raising awareness about how gun violence affects communities and destroys entire families. Each member of "Team Izzy" has different ideas, views, thoughts, feelings, opinions, and talents. One mission, to spread Hope, Peace, and Love. Both sisters to Israel Aragon Jr.
Dalia, the oldest of the three is a Double Major in Psychology & Criminal Justice with a passion for advocacy. Annette, the youngest is a Major in Communications and Minor in Business with a passion for creative change. Parents of Israel Aragon Jr., both share a passion to raise awareness and spread ideas for prevention and gun control. A passion to obtain justice for all those who have been lost to Chicago's violence. To create a brighter future for generations to come. Israel Aragon Jr.'s first and only niece is the youngest activist in the group. She represents all those who we must strive to create brighter and safer futures for. Join us in spreading Hope, Peace, and Love. Together we are stronger, together we can create change.